So our new house has lots of gardens in the backyard and Kim and I have been out there as much as we can lately. We’ve gathered leaves, pulled weeds (at least, I think they were weeds . . .), and started to try and get to know all the little (and not so little) things growing in our yard. It’s been awesome so far – which is something I never thought I’d say about gardening. Anyhow, here are a few I snapped while taking a break from my battle with a seemingly ubiquitous creeper vine. One of several snails we found while pulling weeds(?) out of what will soon be a vegetable garden. We have several Trilliums, our Provincial flower, growing in the garden. They are protected by law in Ontario, and it is actually illegal to pick them on public land or in conservation areas. Almost everyone I know can remember accidentally picking a Trillium as a kid and subsequently fearing that the police were going to arrest them. We’ll leave these ones be. 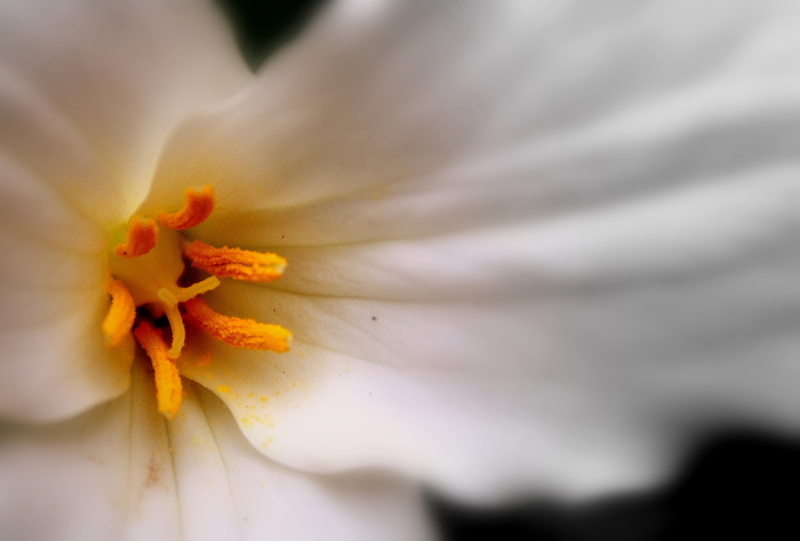 Here I used Picasa to soften the edges and draw the eye towards the stamen and the veins in the petal. A leafy green that I sadly can’t name. 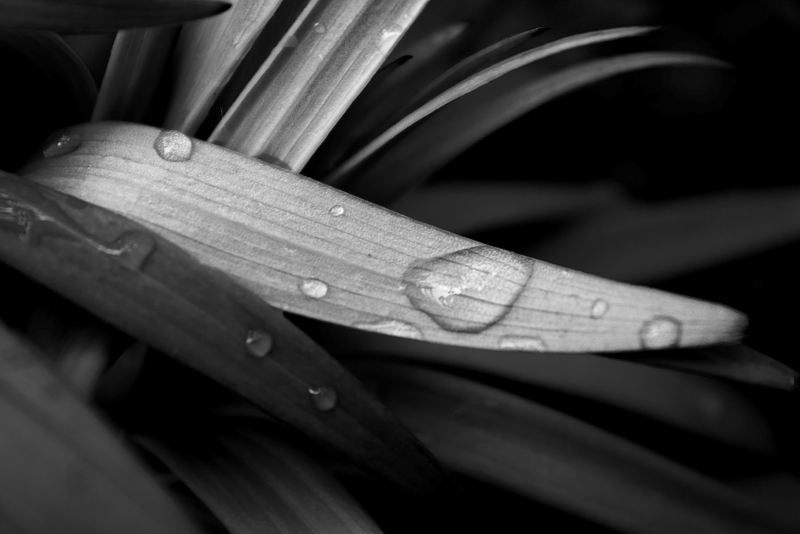 I preferred the B+W here as I liked the deep contrast and how it highlighted the droplets on the leaf. 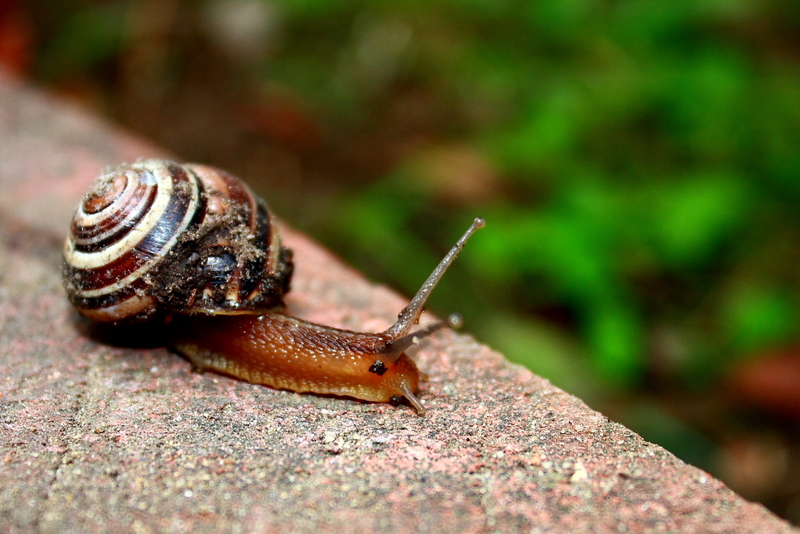 Another snail climbing the bricks to our soon-to-be veggie garden. I really liked the DoF here. 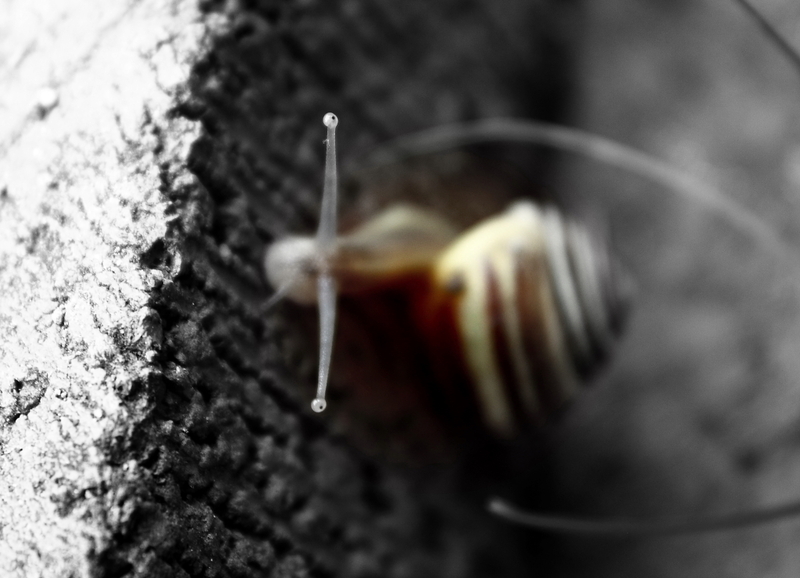 Initially, I preferred the colour version, but lately I have gravitated more towards the B+W with just a hint of colour in the snail shell. Thanks Amber! It’s always great to hear your opinions. It’s nice to know that different places around the world are taking some steps to protect such beautiful plant life. Excellent photos Mike!!! Remember… nature has no weeds. You’re so right Kev, there are no weeds in nature. Those pioneering and invasive species are an essential part of any ecosystem – I should know I wrote an entire thesis on them. But that still doesn’t mean I am happy about the creeping vine that’s trying to choke out my strawberry plants! Thanks for the comments! Great Photos Mike. Number 3 is my favorite. When you done your garden you can always come to Yellowknife and help with ours. You should have time to finish yours with the weather and temperature differences here. Again great job, wait I think number 2 might be my favorite now. Crap, I can’t decide.